The National Central Bureau of Interpol enhanced by the United Nations and Federal Bureau of Investigation have successfully passed a mandate to the current president of Nigeria his Excellency President Good Luck Jonathan to boost the exercise of clearing all foreign debts owed to you and other individuals and organizations who have been found not to have receive their Contract Sum, Lottery/Gambling, Inheritance and the likes. Your payment would be sent to you via any of your preferred option and would be mailed to you via UPS. Because we have signed a contract with UPS which should expire by the end of September 2010 you will only need to pay ONE HUNDRED AND FIFTY DOLLARS instead of FIVE HUNDRED AND FIFTY DOLLARS saving you FOUR HUNDRED DOLLARS So if you pay before September 28 2010 you save FOUR HUNDRED DOLLARS Take note that anyone asking you for some kind of money above the usual fee is definitely a fraudsters and you will have to stop communication with every other person if you have been in contact with any. Also remember that all you will ever have to spend is ONE HUNDRED AND FIFTY DOLLARS nothing more! Nothing less! And we guarantee the receipt of your fund to be successfully delivered to you within the next 24hrs after the receipt of payment has been confirmed. Note: Do disregard any email you get from any impostors or offices claiming to be in possession of your ATM CARD, you are hereby advice only to be in contact with Mr. Jay Williams of the ATM CARD CENTRE who is the rightful person to deal with in regards to your ATM CARD PAYMENT and forward any emails you get from impostors to this office so we could act upon and commence investigation. Though on the matter of the boosted exercising of Mister Good Luck Jonathan, I will have to commend the cooperative efforts of The National Central Bureau of Interpol, the United Nations, and the Federal Bureau of Investigation. They were able to make His Sexcellency (as I and People Magazine refer to Mister Jonathan) honor my Nigerian Contract Sums, Lottery and Gambling winnings, Inheritance and the likes in only Seven Months. Frankly, I was expecting it would take Seven Years. This has got to be the most spectacular feat of Bureaucracy ever executed! If only Max Weber were alive to see this. What a triumvirate you three make! Now, on to the issue of receiving my money, I have several issues with your ATM proposal. First, I am insulted by your patronization. Of course I know how an ATM works. I do not need a manual! Second, this is completely impractical. If I were to withdraw $3000 in cash everyday, where would I keep it? Third, have you done the simple math as to how long it will take a person to withdraw Eleven million Dollars at a rate of $3000 per day? It would be exactly 3666.66666666666666667 days! Calculating weekends and Bank Holidays, it would take me more than Fifteen Years to withdraw the entire Sum! And consider the unknowns. Will Mastercard still exist in Ten Years? Will you be able to provide me with a new ATM Card in 2014, 2018, and 2022? This proposal is most certainly indecent. I would rather eat all the babies in Ireland than go through with this. Because of the absurdity of your first proposal, I am going to negotiate the payment of the Eleven million Dollars on my terms. You are going to comply because I have directed my private Security Contractor forces to apprehend Miss Donna L. Vargas, Miss Rovenda Elaine Clayton, and your African contact Mister Jay Williams. They are being held in an undisclosed location and will be released upon completion of my demands. 1. 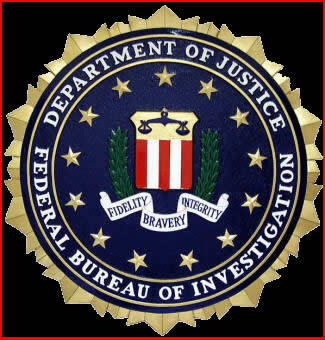 Using the FBI wing of your tri-bureau operation, you are command the Treasury of the United States to receive and then transfer the Eleven million Dollars to Fort Knox, Tennessee, where the money will be exchanged for Gold. 2. My private Security Contractors will arrive at Fort Knox to receive the Gold and transport it to an undisclosed location. 3. The Treasury of the United States will cease to a) leverage tax evasion lawsuits against my Gold Company, "A.U., Give Me Your Cash for Gold!," and b) agree to not tax my clients for the business they conduct with my Gold Company. 4. Those three steps are to be completed within Three Working Days, NOT Three Weeks, upon receipt of this email. Failure to comply will result in an unfortunate outcome for those in my custody. Those are all of my demands. Finally someone with the guts to stand up to the FBI and FBI-related activities.